SESSION CAUSE LIST MWANZA CAUSE LIST 11TH TO 15 FEBRUARY.. SESSION CAUSE LIST ARUSHA CAUSE LIST FOR FEBRUARY,2019..
SPECIAL CLEARANCE SESSION CAUSE LIST CAUSE LIST BEFORE HON MRUMA JUDGE - CAUSE LIST BEFORE HON MAKANI..
COURT CALENDAR FOR 2019 SESSIONS.. RESOLVED COMMERCIAL CASES FROM JANUARY, 2018 TO DECEMBER,..
Mr. Willy Machumu who is the Court Administrator of the High Court of Tanzania, Commercial Division opening the in house staff training on how OPRAS comprehend the Judiciary of Tanzania Strategic Plan of 2015/16 – 2019/2020. 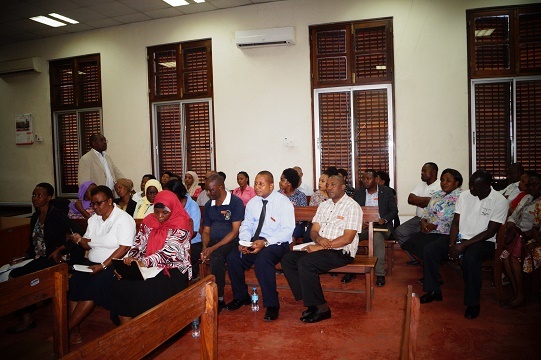 The training held on 10th August,2018 at the High Court of Tanzania, Commercial Division. Copyright © 2019 Commercial Division. All Rights Reserved.